Playing a solo piano special during the offering can be a challenge for the church pianist. What is expected or required of you can vary from church to church, and even from one service to the next. As always, it is important to know what the expectations of the pastor are, and to do your best to fulfill them. Practically speaking, this interval can be a great opportunity to minister to the congregation through your instrumental selection. Because of this, you should choose your songs deliberately and endeavor to make this time a blessing. I must admit that one of my biggest pet peeves at church is those who feel that the offering time is the appropriate time for chatting with their neighbor in the pew. Unless this is the designated “fellowship time”, it is frustrating to work hard preparing a special, and then to feel that it is being ignored entirely! However, part of that reason that attitude is prevalent in some churches is because the pianist doesn’t work hard to prepare something that will keep the attention of the congregation. So rather than get frustrated or annoyed, or develop an “I-don’t-care” attitude, I would suggest that we work to be a blessing to those listening, and make them want to listen to what we are playing! Although beautiful music can be enjoyable without any words, in a church setting, you want people to understand and think about the message of the song. This is best accomplished if they can “sing along” in their minds while you are playing. Choosing songs that are familiar to your audience will encourage them to listen actively rather than passively. Select songs that are appropriate for the type of service you are in (Sunday morning, Wednesday evening, revival, special occasions). Consider what is going on. Is it a patriotic service? A missions conference? Does your church have a theme for the day/month/event? Is it a prayer meeting? While none of these things dictate your choices, they can help you make selections that will be well-suited to the service in which you are playing. Also, be aware of what is going on and the “mood” of the service. While you can’t always know this, be sensitive to your surroundings, and to the leading of the Holy Spirit. Is your service a celebration? It would not really be appropriate to play something slow and contemplative. On the other hand, is your church going through a time of challenge or even grieving? Be discerning in your choices. Choosing the proper song for the service in which you are playing is a subtle, but effective, way of being “in tune” with the overall service. This is a given, and probably doesn’t need to be stated, but I’m going to say it anyway. Be prepared! Practice, plan, prepare. Anything done for the Lord deserves to be done well. Whether you like to play from published piano pieces, create your own piano arrangements, or simply play from the hymnal, one of the keys to being a blessing (and not losing your audience), is to play something interesting. Now, I’m not suggesting that you play something strange or weird just to get attention. Some arrangements stray so far from the original melodies and harmonies of the song being played that they are no longer recognizable. There are many ways to create interest, and to keep a piece from sounding stale or boring. Good use of dynamics, simple modulations, changes in tempo, and even creating a medley of related songs are just a few easy ways to keep your pieces stimulating. Every church varies on this, but be mindful of the time. It is a good rule of thumb not to play much longer than it takes for the ushers to finish receiving the offering. Now, in a small church like the one I attend, the whole process takes about 60 seconds. It is very hard to play any kind of arrangement in that amount of time, but I try to limit my selections to 3 minutes maximum, and usually less than that. In a larger church, you may need to play a much longer arrangement. It is a good idea to time your pieces, and then edit accordingly. While these are some practical pointers, the most important advice I can give in every part of our playing is that we never forget that our service and ministry is unto the Lord. Be prayerful about your playing, and remember you are ultimately playing for Him. When I start to get lazy, or begin to feel irritated or ignored, or even prideful, I try to remember that I am playing for the Lord, and He is always listening! More than anything else, this keeps me motivated to do my best. These are just a few simple tips that have helped me in choosing and preparing an offertory. What tips would you add? 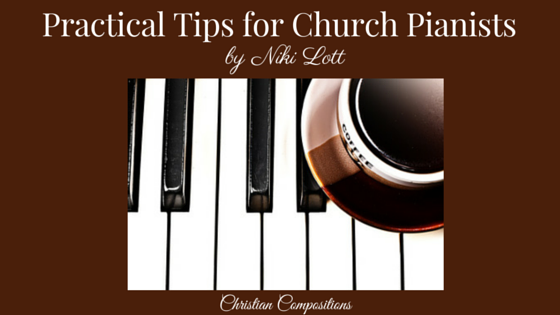 This entry was posted in Practical Tips for Church Pianists and tagged Christian, church, Musician, Offertories, pianist, Practical Tips. Bookmark the permalink. Thank you for these tips! I LOVE playing offertories. I think that is my favorite thing to do music-wise. 🙂 And yes, it is a huge pet peeve for me too, when I have practiced my fingers off, and people talk. It is usually only a few people, but I have just had to give it to the Lord and try to play it like it’s only for Him. Sometime, could you include some of your favorite offertory resources? I have a ton of books, but most of them take a little more practice than I can give them at this point in my life. I know I have a book “Showers of Blessings” from the Wilds. It requires hardly any practice and sounds nice. Do you have any books like that? Thank you, Joy! I really enjoy playing too. I’m planning for my next post to be some favorites and recommendations. Thanks for the suggestion!